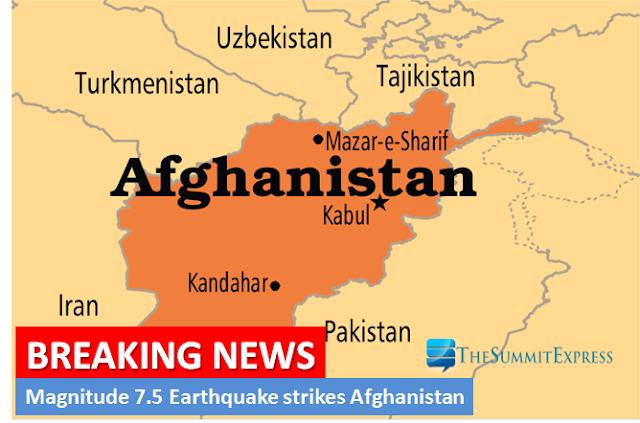 An earthquake with magnitude 7.5 occurred near Feyzabad, Afghanistan at 09:09:32.70 UTC on Oct 26, 2015, the U.S. Geological Survey said. The strong earthquake caused severe damage, injuries and deaths in north eastern Afghanistan and neighboring countries of Pakistan and India. "Significant casualties are likely and the disaster is potentially widespread," the USGS said. Reports from the Associated Press said that the quake caused the deaths of 29 people in northwestern Pakistan, bringing the total death toll to at least 45 as of press time. The quake lasted for for at least a minute and whose epicenter is a few hundred miles from the site of a 7.6 magnitude earthquake that killed more than 75,000 people in October 2005, USA Today reported. Meanwhile, ready.gov said aftershocks can be expected. "These secondary shockwaves are usually less violent than the main quake but can be strong enough to do additional damage to weakened structures and can occur in the first hours, days, weeks, or even months after the quake." "Be aware of possible tsunamis if you live in coastal areas. These are also known as seismic sea waves (mistakenly called "tidal waves"). When local authorities issue a tsunami warning, assume that a series of dangerous waves is on the way. Stay away from the beach," ready.gov added.